Macedonia And Greece Fight For Rights To Name And Alexander The Great : Parallels Alexander the Great is central to identity in Greece and Macedonia, which are quarreling over Macedonia's name — and bragging rights to the 4th century B.C. military genius. Greek protesters in Thessaloniki wave flags and banners during a rally against the use of the term "Macedonia" for the neighboring country's name on Jan. 21. Greek authorities argue that the name Macedonia might suggest that Skopje has territorial claims to the northern Greek region of the same name with Thessaloniki as its capital. To an outsider, this most Balkan of conflicts looks absurd: two countries fighting over a name and a historical icon who lived 25 centuries ago. But the 26-year-old dispute between two southeastern European neighbors — Greece and Macedonia, over who owns the name "Macedonia" — is seen by both sides as existential and essential to national identity. Greece, which prizes its ancient history above everything else, is especially sensitive. On Sunday, more than 140,000 Greeks marched to parliament in Athens during a flag-waving "Macedonia is Greece" rally, chanting that the name "is in our soul." Though the attendance fell far short of the more than 1 million that organizers predicted, it rivaled the size of crowds seen during major anti-austerity protests. "Macedonia was, is and will forever be Greek," declared one of the speakers, 92-year-old Mikis Theodorakis, the country's greatest living composer, known for his score to "Zorba the Greek." Theodorakis was once an icon of the left for fighting dictators. The Macedonia protest is also supported by the conservative Greek Orthodox Church and ultranationalists including the neo-Nazi Golden Dawn party. "In Greece, the name dispute has taken on such symbolism, that it's become totemic," says James Ker-Lindsay, a Balkans scholar and professor at St. Mary's University in the U.K. "It has become wrapped up in history and identity so it's not easy for people to be reasonable." Before Yugoslavia disintegrated, it had a republic called Macedonia, which broke away in 1991 and has since been recognized as the "Republic of Macedonia" by more than 140 nations, including the U.S., China and Russia. But it hasn't been able to join NATO or the European Union because Greece opposes its name. Greece has a northern province called Macedonia, also the cradle of ancient Macedonia and its most famous leader, Alexander the Great. Greece considers Macedonia a non-negotiable part of its history. Its neighbor, meanwhile, considers Alexander — who incorporated its land into an empire that extended to India — part of local identity. Macedonia's flag is emblazoned with the Sun of Vergina — a symbol associated with the dynasty of Alexander and his father Philip. As a result, previous Greek governments have claimed that the Republic of Macedonia — tiny, impoverished and with virtually no military might — also has territorial designs on its province. So Greece calls its neighbor Skopje, after the capital, or Fyrom, the acronym for the Former Yugoslav Republic of Macedonia, the provisional name under which it was admitted to the United Nations. "Greece does not bear any real costs, other than to its reputation, for blocking the name," Ker-Lindsay says. "But the name issue has done so much harm to Macedonia, which was an early frontrunner to join the EU after it broke away from Yugoslavia. It's also harmed stability in the Balkans. It would be irresponsible not to solve this now." The current governments of Greece and Macedonia, noting the countries have strong business and tourism ties despite the politics of the name issue, agreed and re-started U.N.-mediated negotiations this year. "We have to respect this history and learn from it but not be trapped in it," Greek Foreign Minister Nikos Kotzias, told Reuters recently. His Macedonian counterpart Nikola Dimitrov called the moment a "historic opportunity." Dimitrov is part of a reformist new government in Macedonia that wants detente with Greece and is eager to get the country on a path to EU and NATO accession. By contrast, the current prime minister, Zoran Zaev, has promised to rename the airport and highway and take down an enormous bronze statue called "Warrior on a Horse" (Alexander, of course). In an interview with NPR in 2015, when he was opposition leader, he said such moves only "create enemies. "And he assures Greece that Macedonia has no designs on its land. Zaev and Greek Prime Minister Alexis Tsipras are working on composite names, including Upper Macedonia, New Macedonia, Northern Macedonia and Vardar Macedonia (Vardar is the name of the major river in there). Matthew Nimetz, a retired U.S. diplomat who has served as U.N. mediator on the name issue for nearly 24 years, said he was optimistic. But a recent poll shows that 59 percent of Greeks reject even the composite name. The first sign of that came in Thessaloniki last month, where there was another rally drawing a huge crowd. Protesters clad in replicas of the metal breastplates and helmuts ostensibly worn by Alexander's ancient Macedonian army massed around a statue of the conquerer, near a giant banner that read, "There is one Macedonia and it is Greek!" More recently, Kotzias, the foreign minister, received death threats. 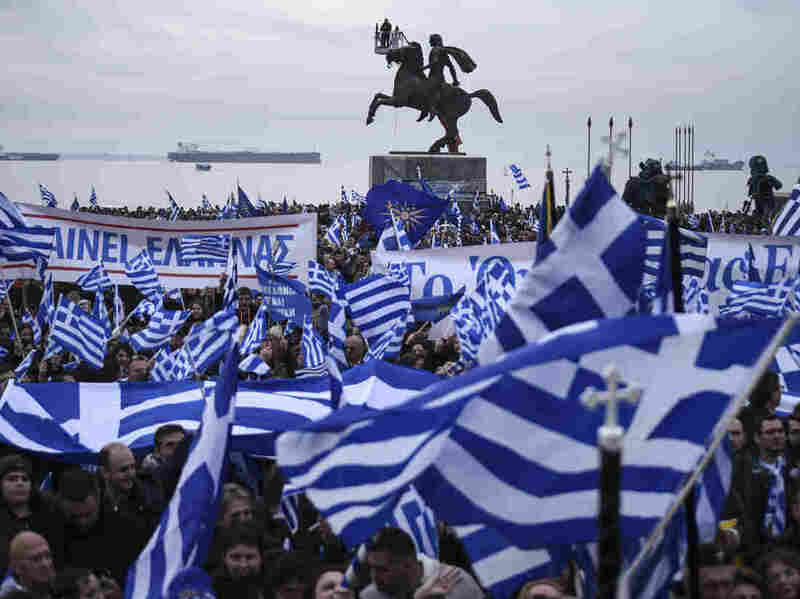 Greek politicians looking to advance their careers have used this issue to whip up nationalism, says Ioannis Armakolas, a professor specializing in southeastern Europe at the University of Macedonia in Thessaloniki, Greece. But they haven't explained to Greeks that it's actually weakening their country's clout in the Balkans and beyond, he adds. Instead, many Greeks cling to the belief that, "Some kind of diplomatic master stroke is possible and the fact that more than 100 countries already call Greece's neighbor the republic of Macedonia can somehow be overturned or ignored," says Nick Malkoutzis, editor of the Athens-based political analysis site Macropolis. "That is detached from reality." Some Greeks do agree. One event posted on Facebook calls for a mock protest to force Libya to change the name of its capital, Tripoli, because Greece also has a city with the same name.